Delhi High Court Personal Assistant Merit List Check Here. Delhi High Court Personal Assistant Marks Check Here. Delhi High Court Personal Assistant Typing Test Admit Card Check Here. Delhi High Court Personal Assistant Typing Test Schedule Check Here. 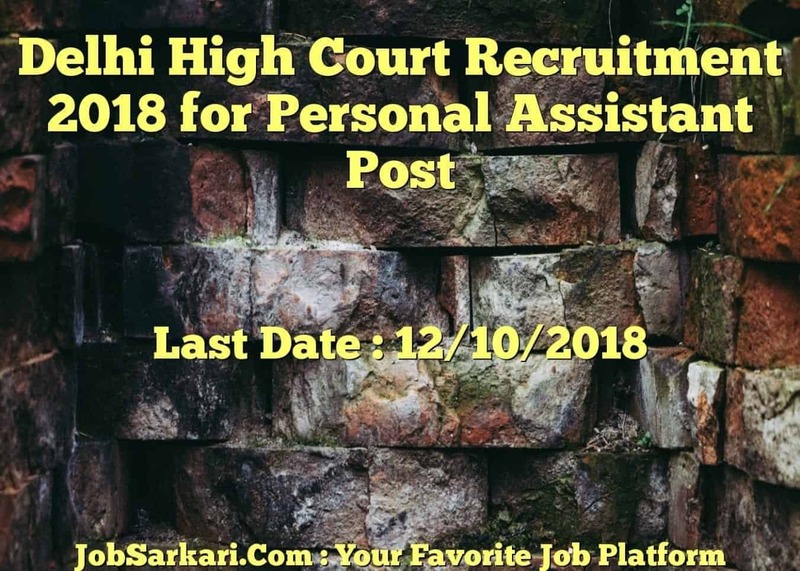 Delhi High Court Personal Assistant Admit Card 2018 Check Here. Delhi High Court Personal Assistant Exam Date Notice Check Here. Delhi High Court Notification is out. Delhi High Court is recruiting for 35 Personal Assistant Typing Test Posts. You can check Delhi High Court - Delhi High Court last date, download Delhi High Court notification, visit Delhi High Court official website and check other Delhi High Court Vacancy details.Complete Vacancy and recruitment Details about 35 Personal Assistant Typing Test vacancies in Delhi High Court are provided below by JobSarkari.Com only for you. Candidate must Have Passed Graduation With Typing Speed of 100 w.p.m. in Shorthand (English) and 40 w.p.m. in typing (English) on Computer with knowledge of Computer. Maximum Age for OBC 30 Years. Maximum Age for SC / ST 32 Years. Q. What is the Last Date For Delhi High Court Personal Assistant Typing Test Vacancy ? A. 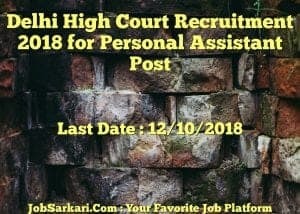 Last Date for Delhi High Court Personal Assistant Typing Test Posts is 12/10/2018. Q. What is the Form Type of Delhi High Court Personal Assistant Typing Test Recruitment ? A. The Form Type for Delhi High Court Personal Assistant Typing Test Posts is Online. Q. How many vacancies are available in Delhi High Court Personal Assistant Typing Test Posts ? A. There are about 35 Vacancies in Delhi High Court Personal Assistant Typing Test Posts. Q. What is the Full Form of Delhi High Court ? A. Full Form of Delhi High Court is Delhi High Court .